A shocking news has created fear and tension among the people who rely on eggs as their Protein source. A man named Md. Shamim Ansari was arrested on Friday morning from Park Circus Market for selling eggs made of plastic. “A shopkeeper named Md. Shamim Ansari was arrested on Friday morning from Park Circus Market for allegedly selling artificial plastic eggs to the complainant Anita Kumar,” Kolkata Police’s Enforcement Branch officer said. The complainant when brought the eggs said that she felt something of plastic when she brought the eggs. When the eggs were broken, the yolk got scattered instantly and mixes with the white liquid. Also the eggs while cooking, don’t have the familiar smell of eggs but they have an odour of plastic. Also the egg shell will catch fire as soon as it is exposed to fire. Fake eggs shell harder and rougher in comparison to real egg shell. A rubbery lining is present in the shells of fake eggs while the shells of real eggs are doesn’t have a spot or any lining. Yellow part and white part of the fake eggs will mix if let undisturbed while the yellow and white part remain clearly visible if if undisturbed. While cooking the fake eggs doesn’t smell but has a little odour of plastic. 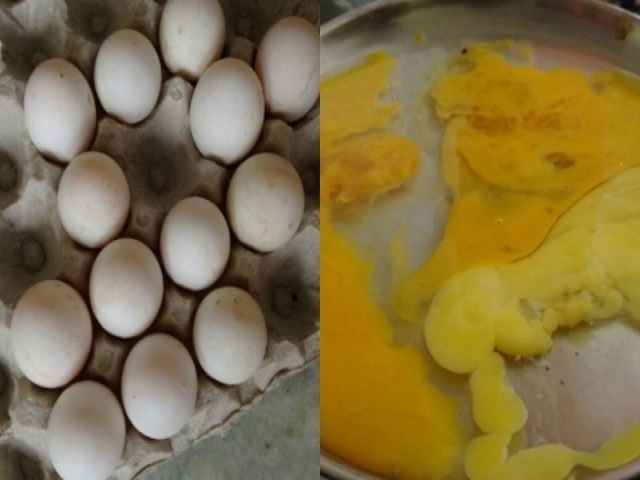 So next time, do keep in mind the following points while buying and making an egg.